Since it’s Wednesday and you’ve successfully made it almost halfway through the week, I’m going to reward you with something really pretty! 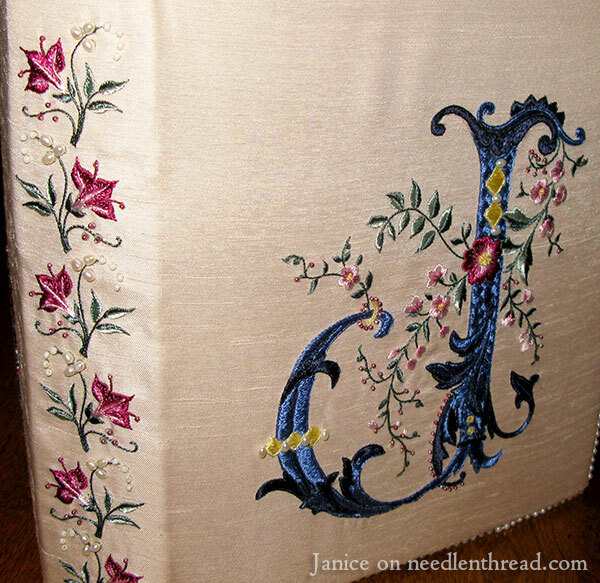 This is a photo album cover hand embroidered by Jan Conners with a gorgeous monogram, front and center, and a lovely floral vine down the spine. Let’s take a look at it! We’ll chat about the embroidery and supplies used, and about the construction of the cover. You may click on any of the images below for a larger version. First, the Monogram!! What a beauty! Jan’s color choices – especially the regal blue – are striking. I think she did a gorgeous job on it. 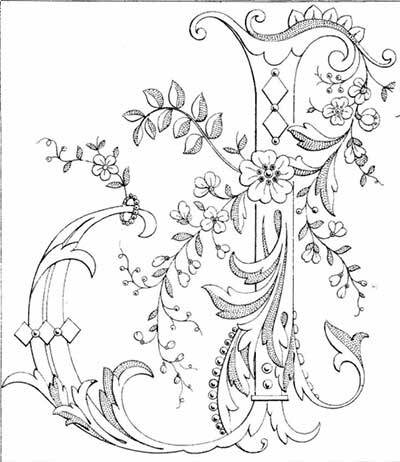 The monogram itself comes from Sajou Album 612 (PDF), which you can download from the Antique Pattern Library. If I had to pick my favorite part of the design, it would be this area, right here! Jan’s stitch & shade choices create a wonderful dimensional illusion at the top of the J.
I love the splash of the color from the central flower. Her choice of working the satin stitch in a basket weave pattern on the main part of the J was smart. It adds texture, and it also keeps the satin stitches from being too long. Here’s the front of the photo album, finished. To be able to source her materials locally and affordably on a piece that she intended for practice, Jan used DMC’s satin rayon floss for the whole project, along with Mill Hill Petite glass beads and seed pearls. The ground fabric is a synthetic dupioni backed with cotton sateen. To assemble the album, Jan cushioned the embroidery with felt and laced the piece to the album cover. She glued a square inside the front and back covers to conceal the lacing, with a beautiful gold ribbon between the lacing and inside cover, to tie the book closed. She added a pearl edging (from the bridal department at a local craft store) by overcasting it onto the edge of the book. 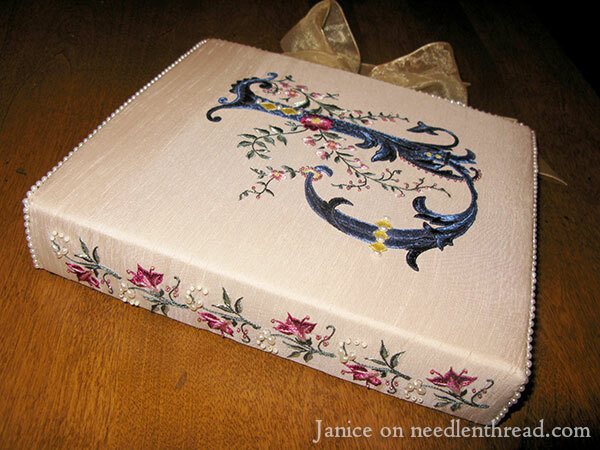 Now that Jan’s worked her “practice piece,” she says she’s building her stash of silk bit by bit, and her goal is to embroider the cover of a box. Thanks, Jan, for sending the photos and the details to share with everyone here on Needle ‘n Thread. I hope you all enjoyed your mid-week burst of inspiration! If you’d like to add your oooooo’s and aaaaaaaah’s to mine, you’re most welcome to leave comments below! If you’d like to browse through other pieces of embroidery from readers here on Needle ‘n Thread, you’ll find lots of inspirational needlework filed under reader’s embroidery. July 4, 2014 An Embroidered Casket – Celebrate this Finish!! Beautiful work. Look forward to seeing the covered box. Thanks for sharing. CONGRATULATIONS, Jan! What a beautiful piece. What an amazing accomplishment! I love your color choices, and the execution is exquisite. Thank you SO much for sharing this with us! OMgoodness, Jan – that is so pretty! I love the color choices as well. Thanks for sharing. So, how do you do a satin stitch in a basketweave pattern? Mary, a Tutorial, please! It IS gorgeous. I think I’d require gloves for those who wanted to browse this album. Small squares, going in different directions to mimic a basket weave. So you’d off set the direction of the satin stitch in each square. This is gorgeous! What an inspiring piece with a unique spin on how to stitch such a fancy letter. It helps me to visualize how to execute the stitches needed for such a style of letter. What a delight! I have so many questions about how it was done that it makes me really appreciate all the detail you put into telling us how you do your projects, Mary. Thank you so much for showing us this lovely monogram. What a beautiful piece of embroidery. I really love your colors and the floral design along the spin is perfect. I can not wait to see what you do with your next project. Thank you for sharing. I’ve been looking for a cover pattern for my 10 year diary. This is absolutely perfect for a book I keep at lounge chair side, and look at daily. Don’t you love geniuses? Lovely photo Albums Jan. 🙂 I have embroidered a couple of photo album covers in the past few years, one was for my last living great-great aunt for her 90th birthday. That had a bit of a floral wreath on it and her name. It was sent to her birthday party and everyone was notified that it would be there, so the family sent copies of more photos to the party than would fit in the album. 🙂 Another one I did for my own grandmother when she was diagnosed with Alzheimers. That was small, and the family filled it with labeled pictures so that the nurses etc caring for her could tell her who she was looking at. That one was “pocket sized” and it was under her pillow when she passed away. I did not have a lot of time to make that one, so it was a lot more simple, a week long project. She only lived a couple of months afterwards. I admit, neither of my album covers were as fancy as Jan’s but I have not made too many and didn’t have a pattern. What a lovely story. I got misty about your Grandma having the album under her pillow. Wow! Beautiful and very inspiring. Jan, WOW! That turned out absolutely beautiful! Mary, Thanks for bringing this to our attention. WOW! Absolutely outstanding! Your stitching needles must truly be smiling. This is gorgeous. I went to the web page for the lettering and discovered the letters I and W were not included in the alphabets. I wonder why. I’ve saved the other letters. 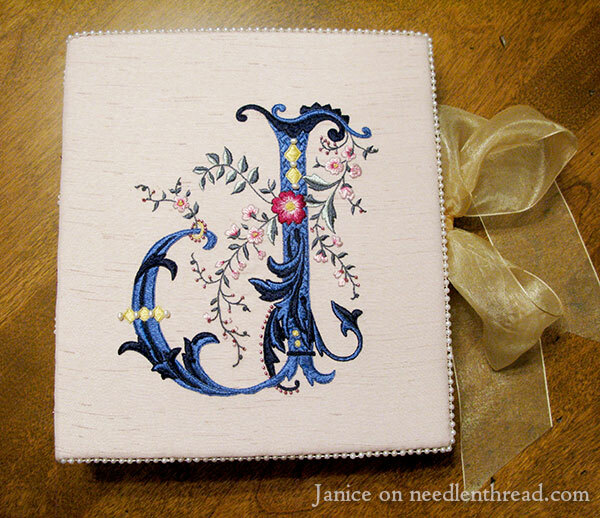 Hi, Jan – This is something I’ve talked about off and on when posting monogram alphabets letters here on Needle ‘n Thread. Why are letters missing? The I and the J are generally considered interchangeable. If the I and the J don’t work interchangeably (on this alphabet, I think the J really looks like an all-out J, for example), then you can use one of the pillars of the H or the K, or letters like that, for the I. For this alphabet, the left pillar on the H makes a good I. In some alphabets, the W can be made by either turning the M upside-down or by combining two V’s, eliminating whatever’s superfluous in the design to make it match the rest of the alphabet. For this letter collection, you can’t really turn the M upside down, so you’d have to combine two V’s. The reasoning behind the absence? Often, it depends on where the alphabets were originally produced. For example, in some languages, W is not a common letter for the beginning of a name. Since it’s uncommon, why waste ink and paper to print it, when, if it were ever needed, it could be created by combining two V’s or flipping the M? WOW – thanks bunches for sharing this inspirational work of art. Beautiful work, Jan. I love all the colours and textures, and you did a great job with finishing the whole thing. Bravo! I started an embroidery project yesterday. I working your Crewel Rooster (in regular surface embroidery stitches). I’m thinking of giving it to my grandma as a Christmas present when it’s done; I’m sure she’ll like it :). I was wondering, is it all right to leave the embroidery in the hoop, or should I take it out of the hoop after each stitching session? It depends, Sarah – If your hoop is bound, and if you have another piece of cloth over the work in the hoop (you’ve hooped up, for example, some scrap muslin with the ground fabric, and cut a hole away or something similar – you could even do the same thing with cling wrap…), then it’s ok to leave it in the hoop, especially if you’re stitching every day or so. But if you’re using something like the Susan Bates plastic hoops, without any protection over the fabric, then I’d say take it out of the hoop. Those plastic hoops with the lip are notorious for collecting dirt, and the longer a piece sits in a hoop collecting dirt (dust and the like…), the harder it is to get the fabric really clean when the project is finished. My hoop is just an unbound, Coats and Clark wooden embroidery hoop without a lip. The wood is smooth and the hardware doesn’t bend. What say you about leaving your embroidery in a wooden hoop without a lip? I think I’d still try to protect the fabric somehow – hoop it up with some Saran wrap on top, in the hoop, too, and cut out a hole. See, as you hold the side of the hoop, the natural oils from your hands get on the fabric right near the edge of the hoop, and then that are ends up more prone to soiling. Just my two cents…. Thanks, Mrs. Corbet! I shall heed your advise. really lovely! I wonder how much different it would look in silk? Fabulous……….. this woman needs to practice? Can hardly wait to see her work once she is up to speed! This is a lovely piece of monogram work and what a lovely album cover congratulations Jan beautiful work. I love the contrast between the light and dark thread colours and the beautiful floral spine and the beaded edge. I really like the directional satin stitch and for a learning piece I think this is inspirational well done Jan. 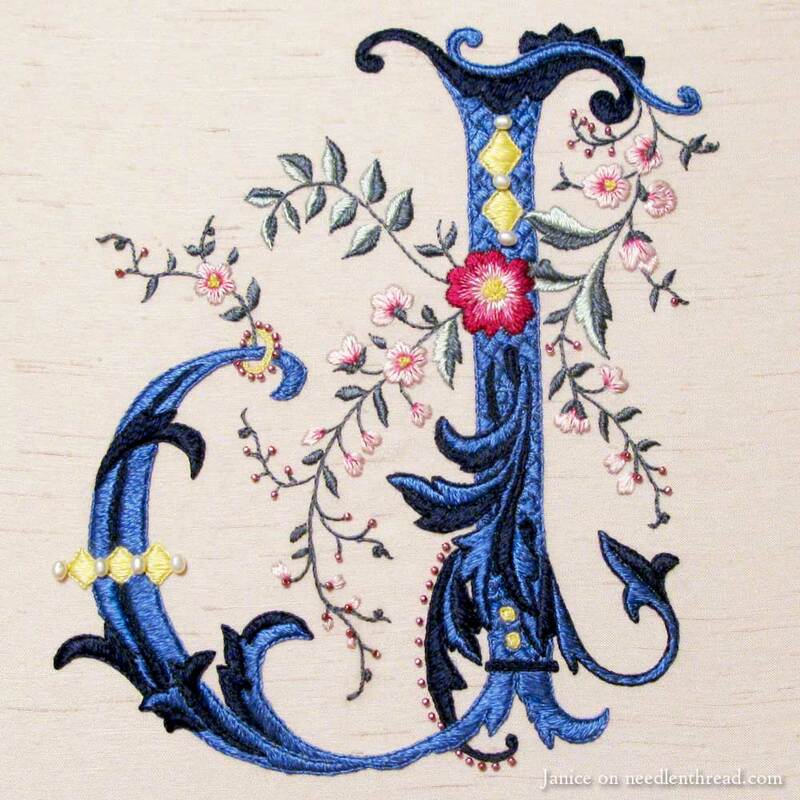 Thanks for sharing Jan’s monogram with us Mary, Sajou monograms are really lovely. Beautiful! I love the choice of color and stitches and it’s beautifully finished. Mary and Jan, thank you for sharing this inspiring work. When I look at antique patterns it is difficult to envision interpreting them. The colors and chosen stitches and the finishing are all so lovely and fresh. I especially admire the execution of the small pink blossoms and the use of the pearls/beads on the spine. Beyond AMAZINGLY GORGEOUS! I wish that I could progress faster so I could make something half as lovely! WOW! I say WOWSER!!! What a GREAT job Jan!!! I’ve always loved this alphabet since Mary first told us about it, but haven’t had the nerve, chutzpah, cheek, whatever it is called… to actually try it. I’ve even modified some of the letters (the one’s belonging to my granddaughters) to make them a little simpler with thoughts of doing them, but just don’t have the whatever it takes to even try. Jan, your work is beautiful! Your colour choices are excellent. I especially like the subtle grey/blue and cream you used for the leaves. I would have gone for green and it would not have looked near so elegant. Bravo! WOW what an accomplishment. This is truly a piece of Art. If this is a practice piece I’d like to see her pieces that are not practice pieces. What a beautiful piece! Jan did a wonderful job and I can’t believe this was a learning piece. I also downloaded the J as it is both my first and last initial. Gosh, Jan has really shown me how it needs to be done!! Thanks for sharing this beautiful embroidery. Love your blog. This is really a great piece of embroidery ! and when you know how difficult it is to use this kind of floss, you can just say : congrutalations ! and thank you for sharing. You made me smile today Mary! Thanks for posting Jan’s lovely project. Sajou rules the world of embroidered letters & they still speak to us, so many years after they were created. How inspiring!! My favorite part (very difficult as it is all spectacular) is the little curved line of pink beads at the bottom left of the downstroke, going into the curve of the J. That got me noticing all the tiny pink bead embellishments. Wonderful! I have a photo album with nothing exciting going on on the front—am going to start thinking about stitching something for it. WOW! Over the moon! Your work is beyond stunning! Thanks for sharing and inspiring. Absolutely beautiful, I am in awe of you and the people that contribute to your site Mary. I have spent many hours wandering your pages and as a very beginner traditional (with a bit of flair here and there) embroiderer, I have learned and gained so much enjoyable knowledge. You can almost smell the flowers on the cover of this book, what a wonderful family Heirloom to keep for future generations. The embroidery is absolutely beautiful. 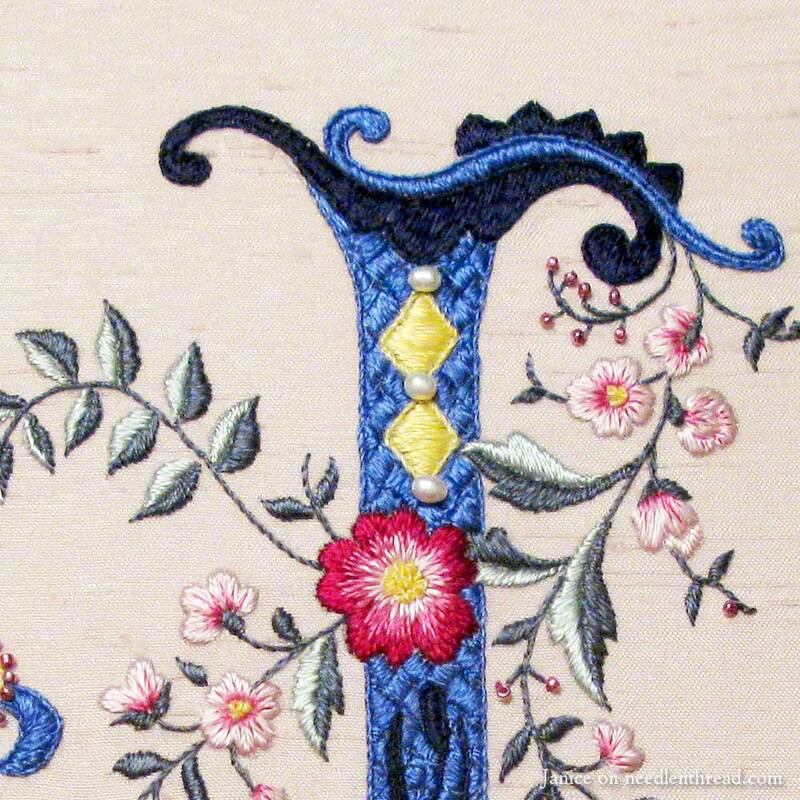 As a practice piece, Jan’s embroidery is superb. Thank you for sharing. On Wednesday’s email you gave a link for a PDF on monograms, but the PDF is password protected and you didn’t give the password in your email. Can you give out the password for the PDF? I would appreciate it. Hi, Nancy – you might need to update your version of Adobe reader, or access the link through another browser. If you’re working on Safari, I know it often has problems access the PDFs on APL, but Chrome opens them right up. This got my attention today ~~ stunning, creative, original. Very beautiful embroidery and cover! Oh my! That is just beautiful! Can’t believe that is practice! Thanks for sharing this project. What a great job! Beautiful. Oh yes – definitely lots of oooo’s and aaaaa’s!! The “J” embroidery is so very very very fantastic. Beautiful work. So textural, with inspired color and component choices. I love the royal blue! Each item is so complementary to the whole. Outstanding needlework! Thank you for sharing your interpretation of Sajou’s letter, it’s so wonderful to see it come to life. Inspirational and fabulous thankyou, imagining a needle case for my daughter. Your scrapbook cover is beautiful. I love your letter. You inspire me. As Jan’s sister, I personally had the pleasure of admiring this beautiful piece of art in person. It’s hard to imagine, but every piece she creates is better than the last. I wish I had her talent. Beautiful work! What a great interpretation for filling that large space and keeping everything so straight! Also, I love how the small flowers look like Santa Barbara daisies. The cute factor plays so well with the elegant monogram. Beautiful! Absolutely beautiful. Love the colours and the texture. Excellent work. Can’t wait to see the ‘real’ project if this is the practice piece. Well done Jan. Thank you Mary! Just stunning!! Really beautiful work. Congratulations on such a beautiful accomplishment. You have inspired me to monogram my wedding photo album when I get around to doing it up. Thank you for sharing. Jan, your work is just gorgeous! My favorite element is the basketweave satin stitching, which I’ve never seen before. Yours is beautiful. And I also love the stem stitching (I think?) around the satin stitching, particularly around the yellow diamonds. It adds so much dimension. Like so many other commenters, I’d love to see the next version. Mary, thank you for sharing this monogram and taking us through the design and execution. What a treat! Bit late but had to say beautiful work! I have fabric loomed from flax in Lithuania more than 100 years ago. I hope to give each of my children a block of this with their initial on it. However I want simple letters with minimum optional features, but I would like some emphasis around the initial. Hi, Joan – you might browse through this site: http://patternmakercharts.blogspot.com In the main chart at the top of the page, you’ll find links to a bunch of different old pamphlets with alphabets. Some are cross stitch and some are surface embroidery. I don’t know if they are marked differently or not, as to which is which, but if you browse through the Sajou ones, you’ll find a variety of alphabet images that you can save to your computer and print. Mary, from the “J” initial article “She glued a square inside the front and back covers to conceal the lacing,” my question is a square of what??? Fabric, card stock, wrapping paper? Next Next post: 12 Tips for a Better Stem Stitch!